The Hollywood Chamber of Commerce held its February 2013 mixer at Loteria Grill Hollywood. for supporting emerging filmmakers from around the world! NewFilmmakers Los Angeles is excited to announce The Gateway Kickstarter Campaign for NFMLA alumni Natan Moss and Lee Sacks. Natan premiered his first short film Odessa at NFMLA in 2008. After, he teamed up with Lee to make Little Odessa, which premiered at NFMLA in 2010 then went on to garner awards, screen at international festivals and obtain distribution. 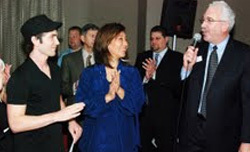 The following year Natan and Lee participated in the On Location Film festival where they won both the first place and the audience award for their short Dear Babushka. 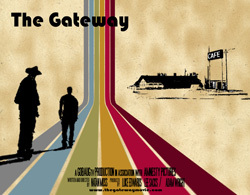 Equal parts crime thriller and modern western, The Gateway is what happens when characters from a Tarantino film show up to a motel run by David Lynch. Sweeping vistas, a mouse farm, free cornflakes and a pool filled with bleach – The Gateway is a film that borrows heavily from many film genres but in essence falls into none. Currently in the financing stages, they just launched The Gateway Kickstarter Campaign to raise additional funds and awareness about the project. The Hollywood Chamber of Commerce through its Community Foundation has given NewFilmmakers Los Angeles a generous grant in support of its programs. The Hollywood Chamber of Commerce, best known for the Hollywood Walk of Fame, is a business organization working to make Hollywood a better community for both businesses and residents. NewFilmmakers LA currently screens at Sunset Gower Studios, an important part of Hollywood history as the former home of Columbia Pictures and of its present as home of Dexter, Heroes, and many other television and film projects. We thank Leron Gubler, Foundation Board Members and the The Hollywood Chamber Of Commerce for their continued support of independent filmmaking and the creative community. Susan For Now, a film screened at NewFilmmakers LA on August 24th 2008, is now available for purchase through Amazon. This NFLA alum picture is a story of an author who decides to become celibate “for now.” Read a full synopsis and purchase the DVD on Amazon now! We have moved to Sunset Gower Studios. Our new address is 1438 N. Gower Street, Box 83, Hollywood, CA 90028.